After the SlimFlex Tag, HID Global presents a new rugged and flexible UHF RFID tag for industrial applications. Thanks to its unique, innovative design, the SlimFlex Tag Square is a flexible RFID tag for industrial applications which can be mounted perpendicularly to a surface, like a flag, with adhesive or screws. 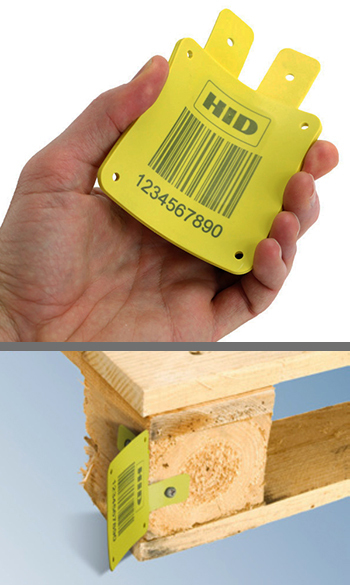 UHF Gen 2 compliant tag tuned for worldwide use, the SlimFlex Tag Square delivers up to 8 m read range on non-metal assets such as wooden and plastic pallets. The yellow color and the flag-like shape make this product an excellent solution for applications that require an RFID tag easily identifiable by the human eye. Furthermore, this flexible UHF RFID tag provides a wider read angle when attached to a corner of an asset. The ThermoPlastic Elastomer (TPE) encasement is waterproof and withstands a wide range of environmental agents, aggressive chemicals and mechanical stresses. The SlimFlex Tag Square can be delivered with custom embossed or laser engraved logo, barcodes and human readable marking upon request. More information is available in the VeryFields RFID Tags Database.